TANMS faculty, Professor Sayeef Salahuddin, has been named by President Obama as one of 105 recipients of the Presidential Early Career Awards for Scientists and Engineers, the highest honor bestowed by the United States Government on science and engineering professionals in the early stages of their independent research careers. 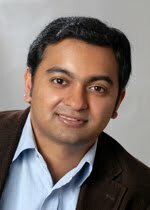 Dr. Salahuddin is an associate professor with UC Berkeley Electrical Engineering and Computer Sciences and a member of TANMS 2-D Thrust. Please join TANMS in congratulating Dr. Salahuddin in this outstanding recognition.